This is one of my favorite high-protein lunches. You can eat it warm immediately after baking or allow it to cool and eat it later. Either way, it’s filling but light and virtually free from sugar, perfect for your 20 no sugar days challenge. Frittatas are really just fancy omelets and this variation is cooked in the oven which saves on washing up. Packed with lots of nutritious ingredients, this recipe makes two servings so feel free to share it with your partner or save half for tomorrow. Place the vegetables in a lightly greased baking dish and place in an oven pre-heated to 400 degrees Fahrenheit/200 degrees Celsius. Cook for ten minutes and then remove. Whisk the eggs, add the bacon/ham and then pour over the vegetables. Sprinkle the grated cheese evenly over the top. Put the pan back in the oven and cook for a further ten minutes until the cheese melts and the eggs set. Share and find more sugar free recipes here. More ideas for your meals, snacks or dessert. 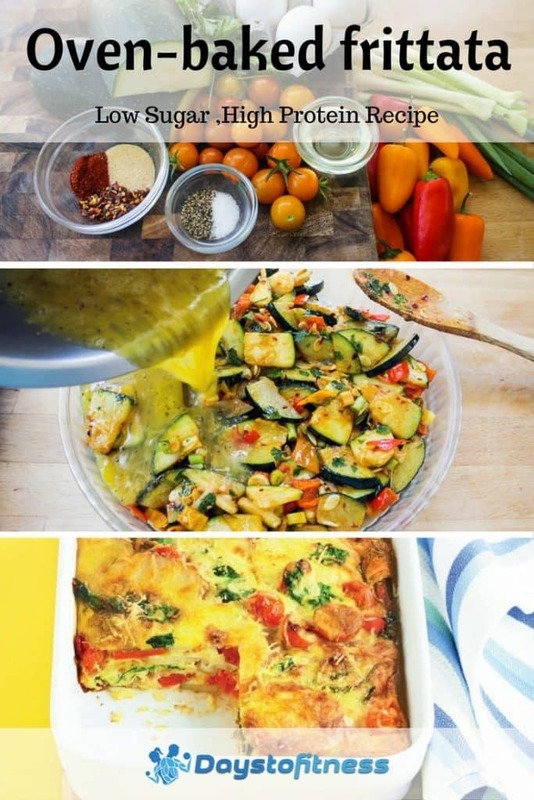 My favorite low-sugar and sugar-free recipes here.